We are offering Stemless Red Chili to our clients. Our company has been rated amongst the best companies in the field of providing Stemless Red Chilli. 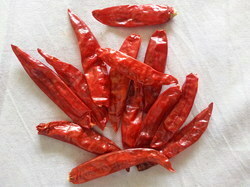 This Stemless Red Chilli is known for its unique flavor and rich aroma. Also, our Stemless Red Chilli is tested completely by our quality controlling department for its quality assurance. We provide Byadgi Red Chillies that is mostly grown in the farms of Karnataka. 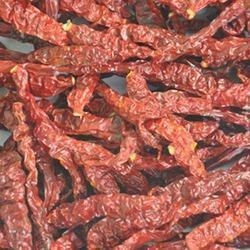 We are counted among the prominent Byadgi Red Chillies Manufacturers and Suppliers in India. The Byadgi Red Chillies offered by us are vital ingredients in various spicy preparations. Our Byadgi Red Chillies are available at the most discounted price in the industry. Banking on the skills of our qualified team of professionals, we are instrumental in offering supreme quality range of Dry Red Chilli. In order to keep pace with never ending demands of clients, our company offers Stemless Red Chilli. - In take of it will helps a lot in your heart related problems. Packing: 10 Kgs/ Bag, can be customized as per clients requirements.